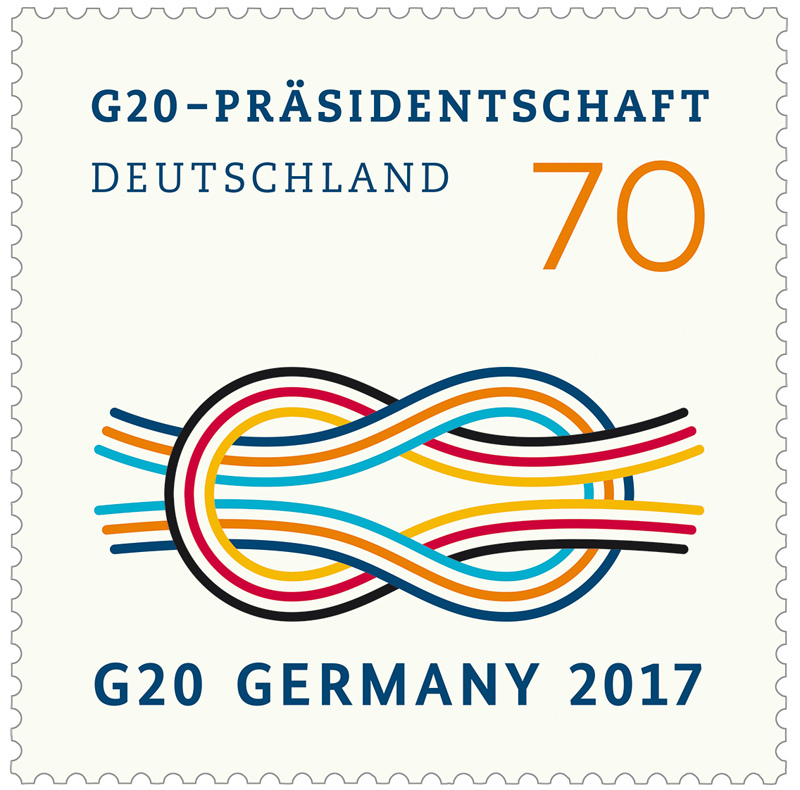 Germany holds the G20 presidency in 2017. The Federal Ministry of Finance has issued a special edition stamp to commemorate this occasion. The G20 was originally launched in 1999. During the global financial crisis of 2008 2009, it grew into the leading forum for coordinating economic policy at the global level. The G20 encompasses the world’s 19 largest advanced and emerging economies, together with the European Union. By taking on the presidency this year, Germany is responsible for organising and hosting a wide range of events, including working-level meetings, ministerial meetings and the summit of heads of state and government. This year’s summit will take place in Hamburg in July. In the Finance Track, Federal Minister of Finance Wolfgang Schäuble and Deutsche Bundesbank President Jens Weidmann will chair the meetings of G20 finance ministers and central bank governors until the end of 2017. G20 finance ministers and central bank governors meet several times a year at various international conferences and summits. In addition, the G20 organises its own separate meeting of finance ministers and central bank governors: this year’s meeting will take place in Baden-Baden, where Minister Schäuble and President Weidmann will welcome their international counterparts for two days of talks on 17–18 March 2017. Representatives from the European Union and other international organisations will also attend the meeting. Commenting on this year’s German presidency, Minister Schäuble stated:"The G20 is the most important forum for the international coordination of economic policy, and it is a driving force in advancing global governance. By coordinating among the members of the G20 – for example, in the area of financial market regulation – we have made the global economy more resilient. Global problems can be solved only through international cooperation." 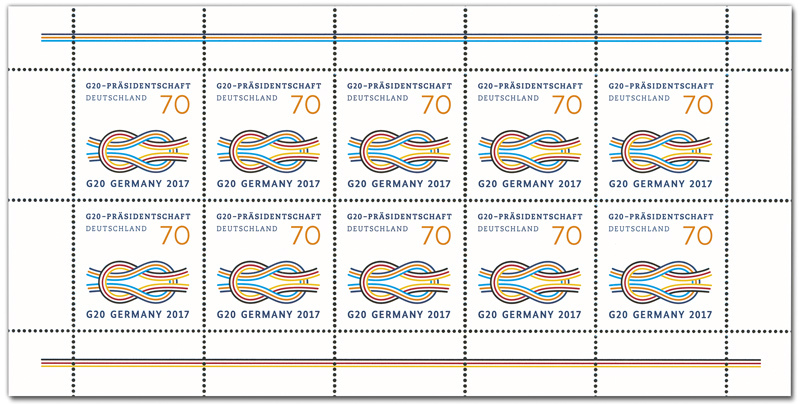 The logo of Germany’s G20 presidency is a reef knot, which symbolically ties together the many topics that require – and benefit from – close cooperation among the G20 in today’s interconnected world. Reef knots are particularly useful for tying things together when powerful pulling forces are at work. It is a symbol that is also perfectly suited to the long maritime and cosmopolitan history of Hamburg, where the G20 summit will be held. 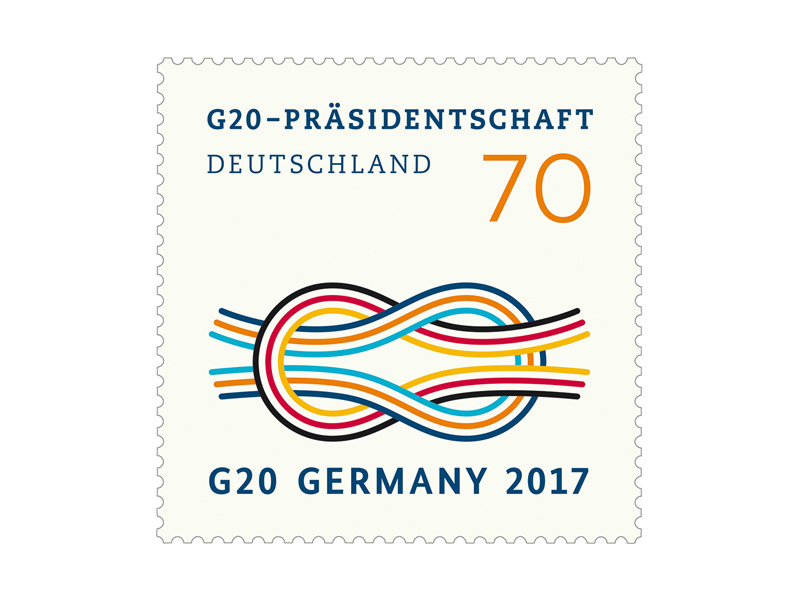 The logo served as the basis for the special stamp design, which was produced by Annette le Fort and André Heers of Berlin (G20 presidency logo design by Scholz & Friends Berlin GmbH).